How did The Guardian reach this conclusion? It used something called the Flesch-Kincaid readability test built into Microsoft Word (you can find an online version of the test here) that purports to automatically give a grade level for text. Thus, Flesch-Kincaid argues that this very post is at grade level 14. 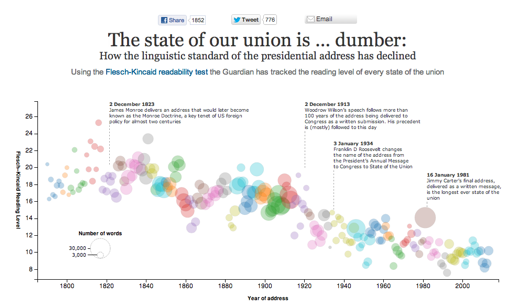 The Guardian ran various Presidential State of the Union reports and addresses (the modern custom giving the State of the Union as a speech rather than as a written submission only gained traction with Woodrow Wilson) and noted a generally downward trend, from 22 with James Madison to 9 with George H. W. Bush. The problem, of course, is that Flesch-Kincaid merely measures the lengths of words in a piece of prose, and the number of words in a sentence. It cannot possibly measure the complexity of the contents of a text (Flesch-Kincaid informs us, for example, that Wittgenstein’s Tractatus Logico-Philosophicus is merely on a sixth grade level) but rather, at best, measures sentence length. And, it is perhaps true, that with the growth of mass media (and thus a broader audience) that shorter sentence lengths have come into play – but one should not deduce from this that Americans are “dumber” than they were in 18th and 19th centuries. Perhaps the more correct inference would be that the Web has somehow infected journalists to report in a more shallow and outrageous fashion.